One of EdTech’s Top 50 bloggers of 2015 has a powerful strategy for engaging kids with YouTube videos. Videos have become a powerful force for reaching new audiences in education. In January, a small Rhode Island school became a viral-video hit with a music video featuring its head of school announcing a snow day closure set to the tunes of Disney’s blockbuster animated feature Frozen. It’s an example of educators tapping into the power of online videos. Students have also used videos to share new ways of learning, like this video series featuring rap as a teaching tool. 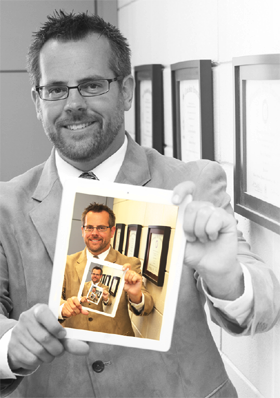 Similarly, K–12 Principal Brad Gustafson, from Plymouth, Minn., is bringing the power of YouTube to his school every day. Gustafson’s supercharged videos share his students’ challenges, successes and stories with a wide audience online. His blog, Adjusting Course, covers his school's activity, including video updates of what's happening in class. It was recently named one of EdTech’s 2015 "50 Must-Read K–12 IT Blogs." EDTECH: How did you get started in education, and what's kept you in it? GUSTAFSON: I started my career in education as a first- and second-grade teacher and loved every second of it. There’s really nothing like having the opportunity to invest in the hearts and minds of young people every day. As an elementary principal, I have had the chance to serve in a similar capacity. I get to collaborate with some of the most selfless and forward-thinking educators in the state. We work together to plan experiences that shape students’ positive character while preparing kids to excel in a world that will be dramatically different by the time their graduation day rolls around. We do this by innovating to ensure that the tools and pedagogy we’re employing are relevant. Students are living in a connected world, and their learning institutions should reflect congruence between the opportunities available to them outside of school and the classrooms they enter each day. These are the reasons I can’t wait to get to work every day. I love being part of a team that is helping kids develop tenacity for learning in a cutting-edge way. We’re not content to perpetuate past practice or pretend to be experts at anything. We are learners through and through. We are immersed in the critical work of learning and modeling how to leverage the transformative power of technology to bring people together. EDTECH: Between “30 Second Take” and Top PD Chef, you're quite active on YouTube! Could you talk about how your involvement with online videos started, and how it evolved over time? GUSTAFSON: Podcasting and video production provides educators a platform to share a more authentic glimpse of the student learning experience. I’ve heard it said that a picture is worth a thousand words, and a video is worth a million. I think there’s some truth to that. When I visit classrooms and see the impactful work being done I often leave with a sense of wonderment. In fact, there are times I literally walk out of a classroom doing a fist pump because I’m so excited by the work our team is doing. I’m not sure this could be adequately captured in a traditional principal’s newsletter or tweet. Actually, that’s probably how a lot of our video work started. I work with students each week creating a 21st-century version of the principal’s newsletter. Kids interview classmates and teachers and share out their learning on video. Feedback to the principal’s podcast crew has been very positive, and that’s not something that happened when I was e-mailing out traditional newsletters. The student podcasts also allow me to build relationships with kids as we collaborate on the videos, and model the important learning work that school leaders need to do around digital communications. The #30SecondTake podcast is an engaging, educational show that brings thought-leaders from across the country together. It’s more of a conversation starter, because each guest host only has 30 seconds to respond to a single guiding question. I find that the work I’m doing with podcasting and our school’s YouTube channel has helped me more effectively support staff and students who are getting started with some of the same work. Digital leadership is not something that can be delegated. Each of us needs to walk the walk. EDTECH: What do you think educators could learn from YouTube, and how do you see it being used in education moving forward? GUSTAFSON: I see value in giving kids an authentic audience for their work. We need to amplify student voice, and YouTube is one way to do this. When kids are completing worksheets or projects, they produce some pretty solid work. However, when I share that their augmented reality book talk videos are being posted to our school’s YouTube channel, their level of engagement goes off the charts. When we give students relevant platforms to connect and share, their ownership increases. We’re using YouTube and other video platforms to share our students’ stories, initiate statewide service projects, participate in national podcasting projects, [engage in] hiring/recruiting, and … connect with a global cadre of learners. YouTube is not something to be feared in education. What we really need to fear are the schools and districts that are not committed to the important work of cultivating digital citizenship through safe and scaffolded learning experiences with students; these experiences should include practice and conversation about being responsible consumers and contributors to YouTube. The first time a student has a conversation about appropriate video creation or YouTube posting cannot be when they are a senior in high school or just starting college. These are conversations and teachable moments that should start in elementary school. We’re doing our students a disservice if we neglect to give them authentic learning experiences that include digital creation, publishing, and opportunities to discuss effective social media use. The 20th century has already happened. There’s a whole new world of learning waiting, and our kids need guides on their journey. GUSTAFSON: Everything starts with pedagogy. I think much of the turbulence you mentioned stems from an outdated pedagogy that many curriculum publishers and districts are still clinging too. Students are ready for a paradigm shift, and we need to deliver. Once we’ve implemented a current and connected pedagogy, we will have the processes in place to approach change and technology through a new lens. Technology is evolving at breakneck speeds. This creates challenges for us that are a byproduct of past practice meeting the modern age. I’m humbled to work in a district and school that truly understands what kids need to be future ready. We’re using approaches like Genius Hour and MakerSpaces to help us embrace innovation. It is educational malpractice to limit student opportunity based on what we refuse to learn. I’m less concerned about turbulence and more focused on what I need to learn to deliver for my students. EDTECH: For education bloggers starting out, what's one tip you'd offer that you've seen readers respond to the most? GUSTAFSON: Everyone has a story to share. Share it authentically. Share it humbly. Share it with gratitude. Above all, share it with the end goal of making a difference for students. That’s really all I try to do when I’m blogging. Through pictures, text, and video, I try to share my heart for kids and what I feel they need to be successful now and into the future. It’s about celebrating the present while purposefully planning for changes to meet students’ needs in the future.